They are: mine, thine, his, hers, ours, yours, theirs. 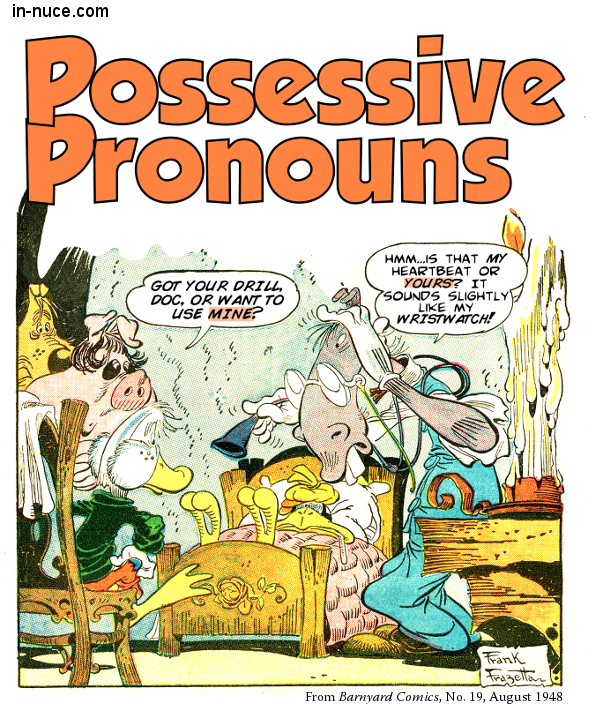 I. Possessive pronouns are words used to represent both the possessor and the thing possessed. 1. A possessive pronoun is not the possessive case of a personal pronoun, but a distinct form found only in the nominative and objective cases. My own is used for mine; your own is used for yours; his own for his; her own for hers; their own for theirs. This book is my own. Stand fast; the ground’s your own, my braves! Each player should have a mitt of his own. 1. A pronoun, and why? 3. What is its antecedent? 4. Gender, person, and number? That house of mine is rented. That book is hers, not yours. “Hers” is a pronoun; possessive, because it is equivalent to “her book.” “Her” is a personal pronoun in the possessive case, and “book” is a predicate nominative. “Yours” is a pronoun; possessive, because it is equivalent to “your book.” “Your” is a personal pronoun in the possessive case, and “book” is a predicate nominative.